Pedal Power wins the day and £250 raised for Music in Hospitals & Care Scotland (MiHC Scotland)! Huge thanks to Alison Frazer, her sister Kirsty, and her 11 year old grand-niece, Felicity. 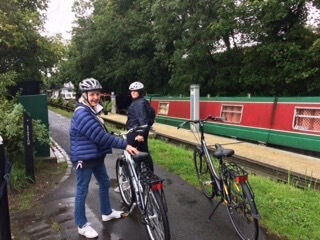 They recently undertook an epic family cycle ride along the canal tow path from Linlithgow to Ratho and back to support MiHC’s 70th anniversary. With a combined mileage of 78 miles and combined age 151 years we think it’s a tremendous job well done. A down pour of rain failed to deter these brave ladies as they took up their trusty bikes and headed out. They were duly rewarded with lovely sunshine and the best fish and chips EVER – even though the kitchen was closed the kind chef at the Bridge Inn at Ratho obliged this fabulous trio. By the end of the return journey, all were exhausted but exhilarated and delighted to have some funds from their wonderful relatives to send to MiHC Scotland. If you’re inspired to take on a challenge for MiHC Scotland this year in aid of our 70th Anniversary please get in touch with Sarah Johnston, Partnership Development Manager by email: sarah@mihc.org.uk or Tel: 0151 556 5848.